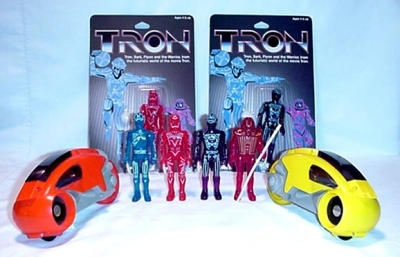 Left in the mix of eighties toys is a rare set of action figures based on the Disney movie, Tron. Manufactured by Tomy in 1982, the line consisted of four figures and two light cycles. The figures were made of a transparent plastic with glow in the dark detailing and accessories. The four figures which represented the key characters of the movie were: Tron ( purple) Flynn(blue) Sark ( red) and a Warrior ( red) . Tron, Flynn and Sark came with a disc weapon, and the warrior came with a staff. In addition two vehicles were made to supplement the line, the light cycles. The cycle colors were red and yellow. A blue cycle is rumored to have been made, but no examples or prototypes have been found. The cycles held one of the characters and was accompanied by a rip cord. By pulling the cord the cycle would zip on its own on any make-believe kitchen floor. Unfortunately, Tron was not a animated kiddie flick, so the popularity died fast. To find a carded figure in excellent condition or a cycle mint in the box is quite rare. Most mint pieces demand over 100.00 plus on the secondary market. Loose, the yellow light cycle with rip cord, and the warrior's staff accessory are true challenges for the treasure seeker.